SET OF 6 ROYAL TETTAU DRESDEN FLOWERS GOLD TRIM DINNER PLATES GERMANY EXCELLENT. ROYAL SAPPHIRE Stainless Steel Dinner Plates| Round Plates Set of 6 Piece| 12"
201 heavy grade stainless steel. Design: Stainless Steel Dinner Plate with engraved floral design. Easy to use and easy to clean. super strong, and dishwasher safe. curved lip there are no sharp edges, Stainless steel is rustproof, weather is no problem, Stainless steel plate is durable and elegant. Elegantly decorated with golden trim, solid white glaze and delicate cobalt blue net patterns on the rims, this exquisite serving plate will ensure the best presentation of your main course dishes. Sophisticated Gzhel Inspired Design with Delicate Cobalt Blue Net, and Intricate Gold Sputtering. PORTSMOUTH in Ivory. by Royal Stafford. Terrific serving platter in this hard-to-find pattern. Royal Stafford Watercolor Gray Floral Porcelain Dinner Plates. Set of Four. FREE Trial! New never used condition. GrayFlowers on border of plate. Royal Stafford. Scattered Flower Pattern. 4 Salad Plates 8 1/4". Unused Condition. Yellow,Blue&PinkFlowers, Coupe Shape. ROYAL COURT CARNATION. All are previously owned and used. Therefore, they are not perfect. Most are going to have a slight degree of utensil marks. Anything that's excessive or out of the ordinary I would've notated above. ROYAL COURT CARNATION. If you have rapid check out, you won't be able to do this. All are previously owned and used. Therefore, they are not perfect. Most are going to have a slight degree of utensil marks. Pattern: Sherwood. Royal Stafford. with gorgeous, embossed oak acorns and leaves on the border. The plates are beautiful. All are previously owned and used. Therefore, they are not perfect. Most are going to have a slight degree of utensil marks. Anything that's excessive or out of the ordinary I would've notated above. 4 Gold Buffet by Royal Gallery - Ornate Egg Salad/Dessert Plates / Easter 8 1/2"
Gold Buffet EGG by Royal Gallery. Ornate Egg Center - Wrapped in a Delicate Floral Garland. Egg colors are: Red, Blue, Green, Pink. 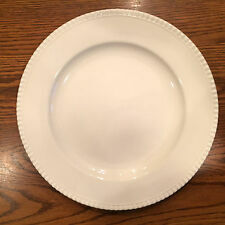 4 White Porcelain Salad/Dessert Plates. If you have rapid check out, you won't be able to do this. All are previously owned and used. Therefore, they are not perfect. Most are going to have a slight degree of utensil marks. Anything that's excessive or out of the ordinary I would've notated above. New, set of 4, never used. Royal Stafford Watercolor Blue Floral Porcelain Salad Accent Plates. Set of Four. FREE Trial! BlueFlower in center of plate. New never used condition. (By Royal Crown, # 4100. Added last photo for color comparisons). Mid-century style floral plates. All matching but in different colors. Set of Four. FREE Trial! BlueFlower in center of plate. New never used condition. Royal Scotland. Porcelain Dinner Plates. White, Blue and Gold. Used as display only. Royal Stafford Watercolor Gray Floral Porcelain Salad Accent Plates. Set of Four. FREE Trial! New never used condition. Made in Burslem England The heart of the potteries. The fourth photo reflects other pieces we have that match this set. This is a GENTLY used dish in very good condition. All are previously owned and used. Therefore, they are not perfect. Most are going to have a slight degree of utensil marks. Skull Salad Plates By Royal Stafford. Ivory And Black. Set Of 4. New. Set Of 4 salad plates by Royal Stafford, Skulls. Microwave and dishwasher safe. These plates are new. Piece: Dinner plates. by Royal China. Quantity:Set of 4. 10" WOOD WEAVE DINNER SERVING PLATE (( FOUR PER BOX )), TOXIC SAFE. (1) DISHWASHER SAFE, BUT HAND WASHING IS BETTER FOR DURABILITY. (4) PRODUCT IS TOXIC SAFE SINCE IT IS MADE OUT OF WOOD. Approx 13" dia. I am not a professional photographer, so bear with the pictures. If you need more detail, feel free to ask, and I will send more to you. Good Pre-owned Used condition, may have light scratches or scuffs. Royal Stafford England Fine Earthenware Set of 4 Salad Plates Grey White 8 1/4"
Royal Stafford England. White with grey and silver print. Made in England. 8 1/4" across, round luncheon plate. Piece: Bread plates. by Royal China. Quantity:Set of 2. 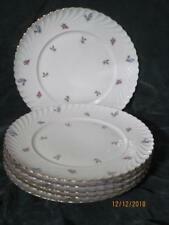 SET OF 6 DINNER AND 6 SALAD PLATES. Design: blue floral and leaves and branches. DINNER PLATE. ROYAL SEASONS. THIS DECISION WILL BE MADE AT OUR DISCRETION BASED ON YOUR LOCATION. DO NOT DUPLICATE OR COPY! This is a used dish but in excellent condition. The colors are vivid. All are previously owned and used. Therefore, they are not perfect. Most are going to have a slight degree of utensil marks. Anything that's excessive or out of the ordinary I would've notated above. The fourth photo reflects other pieces we have that match this set. All are previously owned and used. Therefore, they are not perfect. Most are going to have a slight degree of utensil marks. Anything that's excessive or out of the ordinary I would've notated above.